Good morning everyone! I confess that I have been living under a pile of craft supplies that were unorganized, dumped into boxes and bins...everything in disarray; it was time to come up with a new plan! 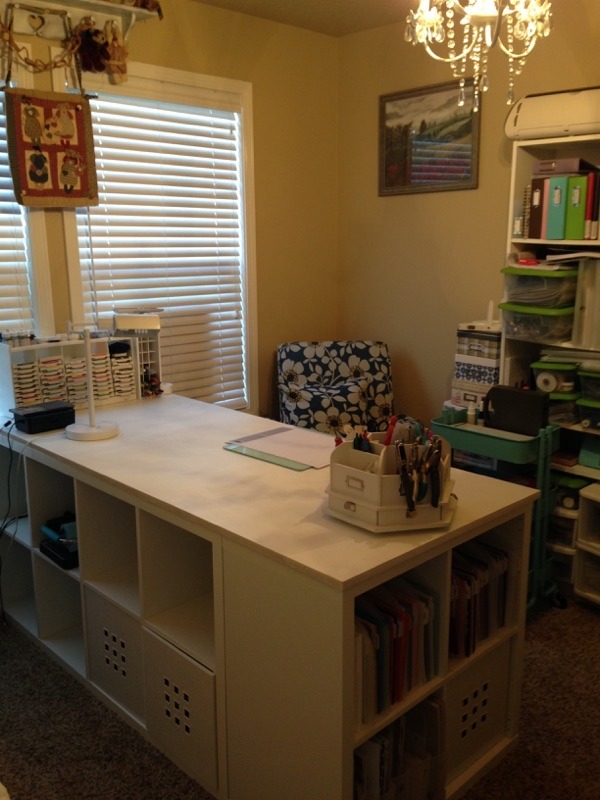 Since I joined Stampin' Up, I have been sensitive about keeping my supplies separated from the rest of my craft things. And, I have a whole lotta craft things from previous design teams, hoarding, etc. :) I think I had completely lost my mojo and was more in a collecting mode as opposed to a creating mood. 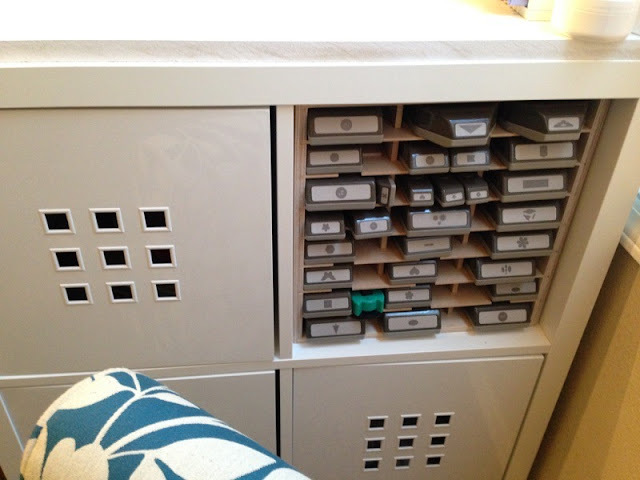 I had some ideas based off things I had seen on pinterest and other blogs about creating a craft table out of IKEA cubes. I am lucky enough to have a room in my home that is my own to go to and create, albeit a fairly small space. I had already made it into my hide-away last year, but I also was not crafting at that time and just wanted things to have a place to go that was more organized. But, to actually work in this space was difficult because the room on my little desk was limited and I confess to being a messy creater. Stuff gets everywhere! 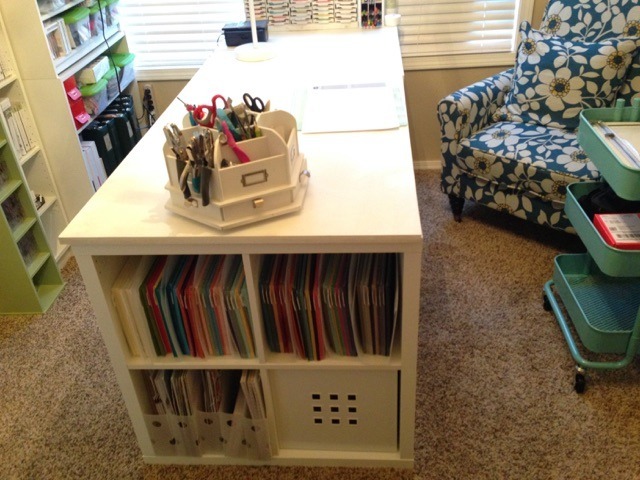 I was very concerned that adding a craft table was going to make my room impossibly small and that would defeat the purpose of my even wanting to be in this room. But, insanity won out, as usual, and I went with the change. We don't have an IKEA close by, but my husband goes to Salt Lake City frequently (nearly 6 hours away) and so I gave him my shopping list and he bought the items and brought them home. It took me about a week to shovel through, sort and throw old stuff out. I also did some purging of things I haven't used in the last couple years, let alone the last 15 years and this was the result. It's kind of crowded in here, but it still has a fun and creative vibe...and this extra work space allows me to get kind of messy without becoming overcome with mess. This the vantage point looking into my room from the doorway. It's a bit close in there, but I was still able to fit my flowery chair in there. I was worried it was going to work! Here is my IKEA cubes work table from another angle. I used 3 cubes, a long one and 2 shorter ones. I was able to make a knee well this way and can store a bench underneath for when I want to sit down. Which is pretty much all the time. All of my Stampin' Up papers are organized with tabbed inserts, so I keep them straight and handy. This is my old work area. As you can see, it wasn't much to work with but now is a great place for my die cutting. It just worked out great for a swap I did where I had to cut everything in multiples of 30! 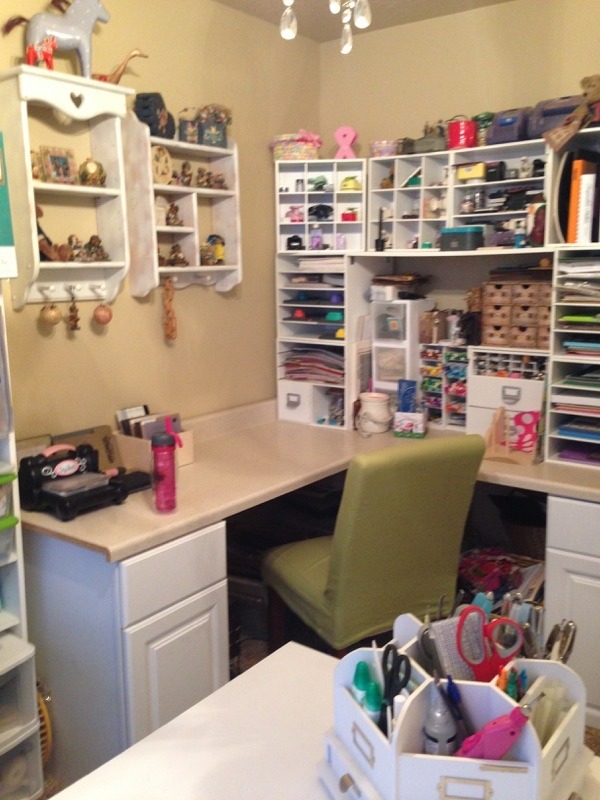 Love, love, love your craft room!